And Abu Hurayrah (may Allah be pleased with him) said: The Messenger of Allah (peace and blessings of Allah be upon him) said: “Whoever spends Laylat al-Qadr in prayer out of faith and in the hope of reward, will be forgiven his previous sins.” Narrated by al-Bukhaari, 1910; Muslim, 760. 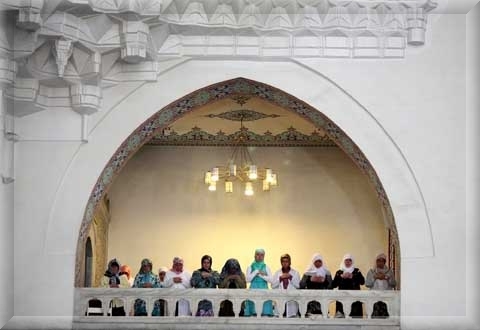 The Muslims are unanimously agreed that it is Sunnah to pray qiyaam at night in Ramadan Al-Nawawi said that what is meant by praying qiyaam in Ramadan is to pray Taraweeh, i.e., one achieves what is meant by qiyaam by praying Taraaweeh. 6 – Every night Allah has people whom He redeems from the Fire. Imam Ahmad (5/256) narrated from the hadeeth of Abu Umaamah that the Prophet (peace and blessings of Allah be upon him) said: “At every breaking of the fast, Allah has people whom He redeems.” Al-Mundhiri said: there is nothing wrong with its isnaad; and it was classed as saheeh by al-Albaani in Saheeh al-Targheeb, 987. 11 – It is Sunnah to observe i’tikaaf (retreat for the purpose of worship) in Ramadan, because the Prophet (peace and blessings of Allah be upon him) always did that, as it was narrated in the hadeeth of ‘Aa’ishah (may Allah be pleased with her) that the Prophet (peace and blessings of Allah be upon him) used to spend the last ten days of Ramadan in i’tikaaf until he passed away, then his wives observed i’tikaaf after him.” Narrated by al-Bukhaari, 1922; Muslim, 1172. 12 – It is mustahabb in the sense of being strongly recommended in Ramadan to study the Qur’aan together and to read it a great deal. You may study the Qur’aan together by reciting it to someone else and by having someone else recite it to you. The evidence that this is mustahabb is the fact that Jibreel used to meet the Prophet (peace and blessings of Allah be upon him) every night in Ramadan and study the Qur’aan with him. Narrated by al-Bukhaari, 6; Muslim, 2308. 13 – It is mustahabb in Ramadan to offer iftaar to those who are fasting, because of the hadeeth of Zayd ibn Khaalid al-Juhani (may Allah be pleased with him) who said: The Messenger of Allah (peace and blessings of Allah be upon him) said: “Whoever gives iftaar to one who is fasting will have a reward like his, without that detracting from the fasting person’s reward in the slightest.” Narrated by al-Tirmidhi, 807; Ibn Maajah, 1746; classed as saheeh by al-Albaani in Saheeh al-Tirmidhi, 647.